It’s time to camp with the clergy! 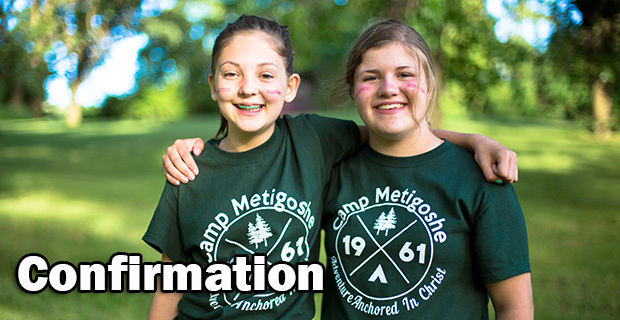 Confirmation Camp is an awesome adventure you share with your camp counselor and your pastor. Have you ever canoed with your pastor? How about made supper together over a campfire? Ever had a really great conversation about faith and life with your pastor? These are what Confirmation Camp is all about! Besides all this, you’ll share great Bible studies with your counselor and meet kids from all over. Your camp experience will include an extreme adventure on the high ropes course. A high ropes course is an obstacle course 30 feet in the air. You and other kids from your church will build incredible bonds of trust and friendship. Your course experience will be unforgettable; you will leave camp with new confidence, lasting relationships, and deeper faith. Camp begins at 5:00 pm on Sunday and concludes at noon Friday.